December is probably one of the most awaited months of the year as it indicates that Christmas time is just around the corner, bringing joy to you and your family members. 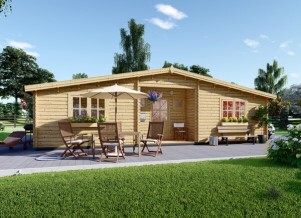 One of the most exciting traditions during this time is decorating your log cabin. This tradition brings a lot of joy to children and nice nostalgic moments to adults. Every year people try to give a new look to their log cabin or residential cabin and make it look especially cozy and nice during Christmas time. Here are some practical tips on how to decorate your log cabin during the Christmas period. Christmas lighting. Christmas lighting is probably the hallmark of Christmas decorations. Rope lights and curtain lights illuminate your dwelling and add a cozy touch to your log cabin. It is very important that you choose the right lighting scheme: red and green is probably the most traditional one along with white, but there are also other options you can go for. Whatever color scheme you decide to go for, it is important to combine it in an organic way. 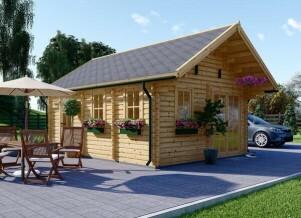 If done in the right way, the cabin will definitely attract your neighbors’ attention and admiration. Christmas tree. A Christmas tree is probably another key figure among the important Christmas decoration elements and it usually becomes the center of attention in your prefab log cabin. That's why it is important to decorate it in a nice way. Your Christmas tree can be natural or artificial. There are plenty of ways to decorate your Christmas tree using wreaths, ornaments, toys, candles, dolls, stockings, bells, etc. There is also the nice tradition of putting your gifts for beloved ones under the Christmas tree to be opened on Christmas morning. Designing of the front door and hallway. The front door is the first thing your guests will see when entering your house. Traditional Christmas wreaths work perfectly as door decoration: you can find one in the Christmas market or do it by yourself. Handcrafted wreaths as well as decoration elements will add an element of uniqueness and will add that special touch to your log cabin. When decorating the hallway you can put a banner 'Merry Christmas' and place a small table with four candles symbolizing the four weeks of advent. Decorating the living and dining area. The dining room is the center of attention of the Christmas holiday. You can decorate it by placing a Christmas tablecloth on it. The white and red colors, along with silver and gold ornaments, will make your room shine and sparkle. You can also use berries and red roses, candles and greenery to create nice decoration elements. Don't forget to put Christmas napkins, tea towels and basket covers for your guests. When it comes to decorating the living room, hang some Christmas stockings on the chimney walls, this has always proved to be a nice Christmas tradition. Decorating the mantelpiece. A Christmas decorated mantelpiece can be the central décor element of your log cabin. It is important to maintain the same theme all around, especially if the Christmas tree and fireplace are in the same room. Using greenery, stockings, bells, etc. will work perfectly. You can find plenty of bright ideas for a DIY mantelpiece decoration online. So, we hope that you'll use our tips to decorate your house for the Christmas period and enjoy the festivities together with your family members.